The story of Craigdarroch castle is quite different from the history of other such extravagant homes. 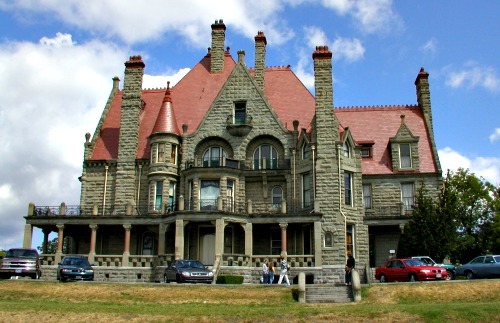 It was to be built for Robert Dunsmuir and his wife Joan during the late 1800's. He was a Scottish immigrant and came to Canada with very little, living in a log cabin upon arrival but managed to turn into British Columbia's richest man. He made his fortune from the coal industry and built a stunning castle home with 39 rooms over four floors. He did not see the mansion completion however and died 10 months after construction began in 1887 from complications from an enlarged heart, also his second daughter died later that year. The original architect, Warren Heywood also died of natural causes shortly after the start of the building project. The castle was finally finished in 1890 and his widow moved into the castle but only got to enjoy it for 18 years as she died herself in 1908. After the Dunsmuir's moved out of the property it had a number of functions including a veterans home, a school and a music academy. Today the castle is open to the public as a museum but if you wish to visit then please check with the site to check any seasonal opening times. As you may have guessed the spirits who haunt the castle are thought to be members of the Dunsmuir family. The most commonly encountered ghost is believed to be Joan Dunsmuir who has been seen walking down the main staircase wearing a ball gown. The odd thing about this particular ghost is that she has only been seen walking down the stairs, never up or in any other area of the building. The basement is also thought to be home to a young girl, believed to be the second daughter who died shortly after Robert Dunsmuir. Her apparition has been seen standing in the basement area staring at the floor, only to fade away after a few seconds of someone entering the room. Other paranormal experiences to be had at the castle include sudden and intense temperature drops and the smell of candle wax coming from the upstairs rooms, though a source can never be found. Ghostly piano music is also commonly heard coming from the main dining room, which is especially odd as this has happened when no one has been in the room and a piano was not present in the castle.